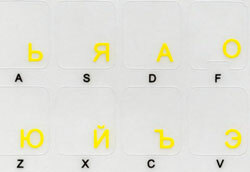 Bulgarian transparent keyboard stickers. The colour of letters is Yellow. The labels are self-adhesive and die-cut for simple peel-and-stick installation. The position of each sticker on the keyboard is specified. The application processes doesn't take more than 10-15 min.